Could the end of the historic association between the Oppenheimer family and Anglo American, the mighty corporate empire, which once controlled two-thirds of the companies on the Johannesburg Stock Exchange, be in sight? It seems farfetched, but behind the scenes the wheels are in motion and could have unpredictable outcomes. On Tuesday evening it filtered out that De Beers’ shareholders might decide to recapitalise the business to the tune of $1bn, which would reduce the company’s debt by a quarter. The announcement seems logical and innocuous enough – another in a long line of recapitalisation efforts necessitated by the lack, and the expense of corporate credit following the collapse of credit markets last year. Yet, there are some tantalising little details which make it possible that we could be seeing the start of a parting of the ways between the Oppenheimer family and the company which South Africa’s dominant corporate dynasty gradually built into a huge monster. Already signs of the division are pretty clear. The Oppenheimers own only perhaps 3% of Anglo, a proportion not to be sniffed at since the company is one of the world’s largest. Nevertheless, it’s a much smaller stake than many investment funds own. 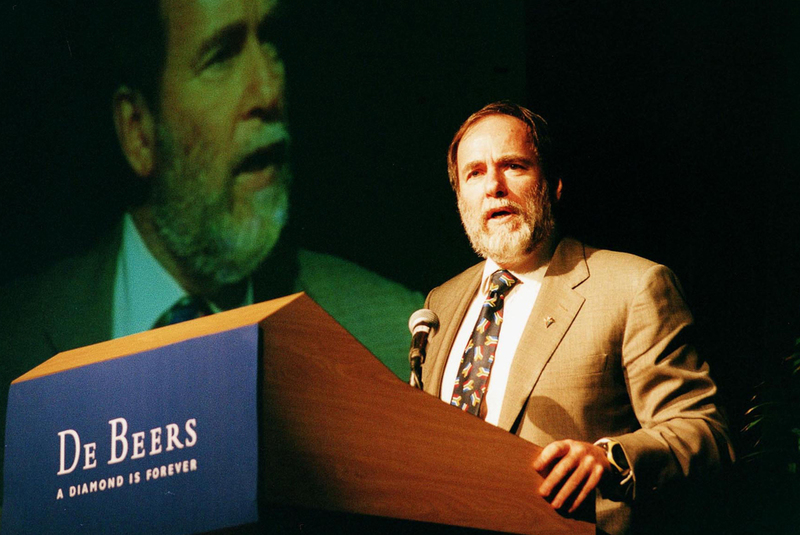 Nicky Oppenheimer is on the board of Anglo, but as a non-executive director. Of course, given the history, behind the scenes his influence is probably still significant. He sat on the selection panel which chose current Anglo CEO Cynthia Carroll. The formal link between Anglo and the Oppenheimer family exists largely within a management contract between them which allows the family to run De Beers. What this contract says is largely unknown, but whatever it might be, it is valuable to the Oppenheimer family. However, it does mean that Anglo has little direct management influence over De Beers. At most times, this would be irrelevant. But in its latest results, De Beers posted a 99% plunge in first-half net profit in July, and more or less broke even. This was obviously by design, because it entailed closing many of the company’s mines last year and that was calculated to prevent the long diamond supply chain from being pumped up from the back. As dominant player in the industry, De Beers is usually the crucial pillar that holds up the roof. However, the company is burdened by $3,5bn of debt, the money mainly spent on Canadian and Botswanan mines during the boom years between 2005 to 2008. De Beers may have been anticipating a bigger take-up of diamonds in China and India than has transpired. So what we have is a company which owes piles of cash, and which is not producing much. Its lucrative contract with the Russians to market their diamonds was rudely chopped off by the European Union. And it seems that in the renegotiation with the government of Botswana over their continued joint venture in the world’s biggest diamond fields, the government got quite a lot of the pie. It gets 50% of the profit, then takes another 15% in tax, and then takes 15% of the total international revenue from its stake in the 45%/40%/15% Anglo/De Beers/Botswana government joint venture. What this means is, at the end of the day, Anglo only gets something like 15c out of every rand profit made by De Beers in Botswana. They are the greatest diamond fields in the world, but they are also getting a bit long in the tooth. All this helps explains why De Beers is chasing new mines in Canada, which brings us back to the funding problem. The refunding problem involves two simultaneous Mexican stand-offs. The first is between the trio and the bankers. The commentary surrounding the announcement suggests the notion of a rights issue is really an attempt by the trio to get better interest rates out of the financiers. But what if their bluff is called? No one is dying to lend anybody any money right now, as the sheiks of Dubai know only too well. Then the second Mexican stand-off comes into play. The question is whether all three parties will follow their rights. Even for the Oppenheimers, reaching into your back pocket for $400m in cash has to be a tall order, but they are so joined at the hip to the diamond industry, it seems likely they will. The Botswana government is joined, not at the hip, but by the neck to the industry, so they are presumably in. If Anglo, itself involved in an expensive expansion, does follow its rights, it would suggest the company has faith in the industry and in De Beers – faith which is not fully apparent to many outsiders. The diamond price rose only slightly during the commodity boom in marked contrast with almost all other commodities. The reason is that the boom was driven largely by Chinese infrastructure requirements. The Chinese appetite for diamonds has grown and will grow, but not at this stage of its development on the scale of other construction-type commodities, and probably not soon. So Anglo, under new chairmanship and with a bunch of new faces on the board, is looking at a problem asset, which may or may not have great longer-term potential. But, as of now, it’s barely profitable, and Anglo takes only a small part of the profits it does make from its prime mines. And it has no management control. Anglo is already in selling mode, announcing recently it would sell its entire zinc division, its fertiliser and ferroniobium operations in Brazil, a clay quarry in South Africa and its Tarmac building materials division. It does not seem likely, but it’s easy to see how the historic association between the Oppenheimers and Anglo could become another victim of the 2008/9 recession. Now that would be the story.